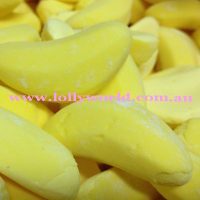 Allens candy bananas are great for a lolly buffet at your next party or corporate function. Use them on cupcakes or birthday cake at your child’s next birthday party. You can just be downright Australian and eat them straight out of the bag. They are full of flavour and also very popular especially for yellow themed parties. You’ll find approx. 40 in a 200g bag and 200 in a kilo bag. The bananas measure approx. 4.5cm long. An iconic proud Australian company, Allens are the largest candy manufacturer in Australia. Allens have been ‘a little bit of fun since 1891’ Stop monkeying around and choose Allens Bananas today.